The width to doors, windows, glass and mirrors is always quoted first. In other words, 10 X 8 means 10 feet wide. Familiarity with window terminology will assist you in buying the right type of window for your home. As windows generally last 20-25 years, new windows are not a frequent purchase item for homeowners. New technologies and performance standards have changed significantly over the past 20 years. 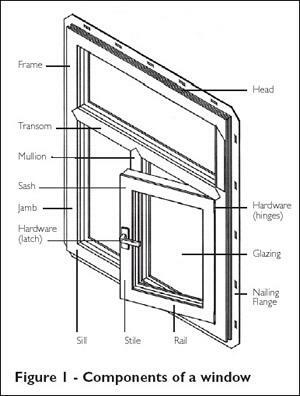 Terminology commonly used in the window industry is presented in this fact sheet. Wood frames have high insulating properties and can be painted or stained any colour. They require ongoing maintenance to prevent moisture damage. They are usually less expensive than frames made of other materials. Clad wood frames have the advantage of wood’s natural insulating qualities, but they require less maintenance. The cladding is usually aluminum or vinyl, available in limited colours. Moisture problems can be reduced if the cladding is applied properly to the wood. If moisture gets trapped between the cladding and the wood, damage and rot can occur unseen. Aluminum frames are strong and durable, but they readily conduct heat. To avoid heat loss and condensation, aluminum frames are required by the National Building Code of Canada to have a thermal barrier inside made from rigid foam, polyurethane or wood, to reduce heat transfer. While aluminum frames are durable and require little maintenance, they have poor insulating properties. Some aluminum frames have mitred joints in the corners, which can allow water to leak into the wall if the joints are not properly sealed or the seals fail. 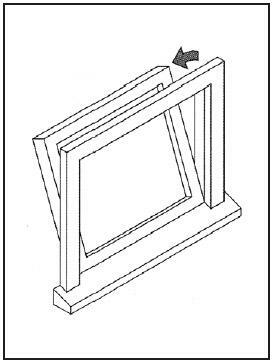 Vinyl frames are available in two types. Reinforced inner structure of another material–wood or metal. Wood is preferable because it has better insulating qualities than metal. Vinyl frames are very durable, and low maintenance–they can resist colour fading, moisture, termites, corrosion and air pollutants. The material can be easily shaped into the required dimensions. Vinyl windows provide “good” insulating properties– even “excellent”, if the cavities in the sash and frame are insulated. Fibreglass frames are relatively new. They are light, durable and strong, even in narrow sizes, they have excellent insulating qualities, and they do not expand and contract with heat and cold as much as other frames. They are also more expensive than other types of windows. The glazing: (or glass) can be a solid sheet of glass, or several panes divided by a ’mullion”.A mullion is a secondary frame that holds the window-panes in the sash. Some glazings are made of tempered glass, to resist breakage, and some are made of laminated glass, which not only reduces breakage, but if the window does break, the glass shards will be too small to cause injury. 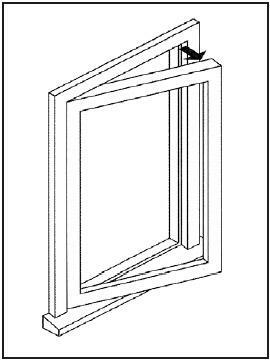 Double-glazed windows have two layers of glass separated with a spacer. It is the minimum standard allowed by the National Building Code of Canada. Air trapped between the glass layers provides some insulating value. Triple-glazed windows have three layers of glass, or two layers with a low-emissivity (Low-E) film suspended between them. The additional layer and air space give triple glazing better insulation value than that provided by double glazing. It is a good choice where extremes in weather and temperature are the norm. Triple-glazed windows can help reduce sound transmission where outside noise is a problem, but because the sash is heavier it may be more difficult to operate than a double-glazed sash. Low-emissivity (Low-E) consists of a thin layer of metal oxide applied to the exterior face of the interior glazing in a double-glazed window. This coating allows sunlight to pass through, but blocks heat from escaping. A double-glazed low-E window provides similar insulation value to that of a triple-glazed unit, but costs less and weighs less. Low-E glazing filters out the sun’s ultraviolet (UV) rays, which can fade furnishings; and can reduce condensation on the window by keeping the indoor surface of the glass and frame warmer. Inert gas fills are another innovation in window technology. Air is replaced with argon or krypton, between the panes of glass in a sealed unit. Inert gases have a higher insulating value than air because they are denser and have lower thermal conductivity, resulting in lower heat transmission between the panes of glass. Argon is the most commonly used gas due to its availability and low cost. Gas fills are a cost-effective upgrade over conventional air-filled glazings. It is possible to get different coloured glazings to reduce solar heating and provide glare control. This technique is normally only seen in commercial or multi-residential highrise buildings. Films can be purchased to reduce glare from the sun, although glare can also be reduced through plantings outdoors, window awnings or shutters. Tinted films should be applied by a qualified contractor, as the application process requires some skill and special tools. Windows come either fixed or operable (openable). Fixed windows do not open. 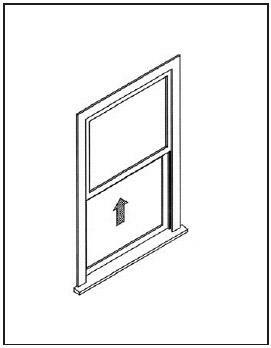 Operable windows have a sash, which is a unit assembly of stiles and rails for holding the glass that moves when the window opens. They are available in a variety of sliding or hinged models. The sash can be made of wood, vinyl, metal or fiberglass and should make a tight seal with the frame when the window is closed. 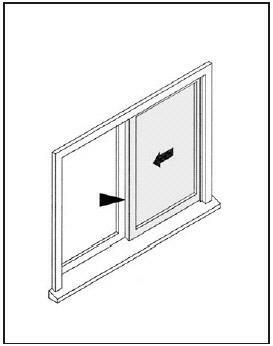 However, if the seal is too tight, the operable portion of the window may be difficult to operate. Hinged on one side and swings open like a door. This design provides the best seal and has the lowest air leakage for a window that opens. Hinged at the top and opens out from the bottom. With an effective seal, this design minimizes air infiltration. Hinged at the bottom and opens in or out from the top. An effective seal minimizes air infiltration. Consist of two sashes, one or both of which slide horizontally in the frame. They are the least energy-efficient of the window types listed here, and the most prone to air and water leaks. 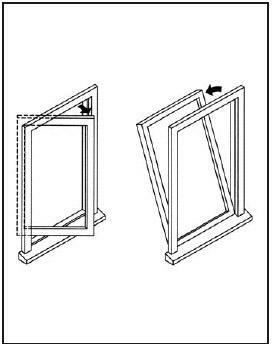 Include one fixed sash (usually the top one) and one that moves up and down in the frame. Include offset upper and lower sashes, which can both move up and down in the frame. Both the singleand double- hung windows are not as energy-efficient as awning or casement windows, but their appearance may be more appropriate to the style of the house, especially in the case of older homes. Swing from the side or pivot from the middle. Others pivot from both the bottom (like a hopper) and the side (like a casement). This allows for cleaning the outside of the window from the inside of the house and can be a valuable feature if a window is in a location where it’s difficult to get at from the outside. Be sure to have an effective weather seal for this type of window. These appear around the perimeter of the sealed glazing unit to provide uniform separation between the panes of glass in multiple-paned windows. Spacer bars are typically made of aluminum, but spacers made of less conductive materials are now available. A high-performance/warmedge spacer can increase the energy efficiency of a window, provided that the frame is made of insulating materials (warm-edge spacers are less effective on metal-framed windows). Spacers incorporate a dessicant that absorbs moisture from the trapped air in the space between the glass preventing fogging and condensation. Should your window fog, it means the seal is broken. This consists of the moldings that surround the window and cover the frame. The hardware used in an operating window may include hinges, latches, cranks or levers. For security, some windows may have locks. 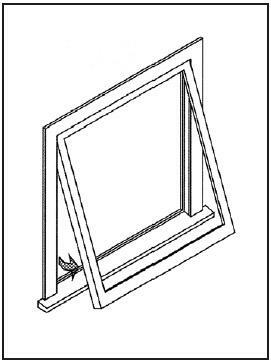 The crescent-shaped locks are standard on many single- and double-hung windows. (sometimes called “mohair”) are more common in sliding windows, and wear out more quickly due to the type of window operation. They are also more likely to be used for exterior weather seals, and can tear easily if the window is opened when the seals are embedded in ice or frost. (sometimes called “bulb”) are also more fragile in cold weather, and can crack if the seal wall is too thin or the window is operated during very cold weather. Weatherstripping is generally the most vulnerable component in an operable window, as it receives the most wear and tear. The seals should be checked annually for signs of wear or damage, and replaced as necessary. Providing custom glass, mirror and shower door products and installation to the following Middle Tennessee areas: Nashville, Gallatin, Lebanon, Hendersonville, Mt. Juliet, Goodlettsville, Murfreesboro, Smyrna, Franklin, Bellevue, Brentwood, Belle Meade, Green Hills Madison, Hermitage and other Middle Tennessee areas.